Quilt Quest is a joint project of the Red River Quilters Guild and the Red River Revel Arts Festival taking place the week after our quilt show ends. The Revel is a field trip for local area 4th graders. Quilt Quest is one stop during their visit, the purpose being to encourage creativity and teach children about caring for others through community service. Volunteers are needed both to guide the children in drawing cheerful pictures on 6" muslin squares as well as demonstrate the sewing together of quilt squares. Cindy will be coordinating shuttles for volunteers as there is limited close parking at the Revel. Shuttles will leave from Pierre Bossier Mall (Bossier City) and Mall St. Vincent (Shreveport) at 8:30 AM each day, returning by 2:30PM. Make sure to sign up with Cindy so she can be sure everyone who needs a ride is accounted for! Any other questions? Check with Cindy! Planning for Quilt Quest begins many months prior to the event, with the first priority being the cutting of 7,500 bleached muslin squares. Next, yards and yards of bright juvenile fabrics are purchased. Letters are sent out to national companies in the spring asking for donation of fabric, muslin and thread. During the Revel, approximately 7,500 fourth grade children from Caddo & Bossier Parishes arrive in busses at Riverview Hall over a 5 day period. The children use fabric markers to draw on a 6-1/2" square of plain muslin fabric. They are encouraged to create happy pictures that they think would bring cheer to a sick child. The children also have an opportunity to arrange the squares on a design board as well as observe our quilters sewing the squares into quilts. The work continues after Quilt Quest is over with the heat setting of all the artful squares. Kits are then assembled with all the components included to make a completed quilt (top, backing, batting and label). When all the kits have been sewn into quilts we should have at least 200 quilts for children in area hospitals and care facilities. These quilts are appropriately called "Love Wrappers". Launched in 2002, Quilt Quest has become a favorite activity of students, teachers, parents, and volunteers. The project is a success at every level. Individuals, organizations and manufacturers provide fabric and supplies (the guild purchases or accepts donations of hundreds of yards of fabric each year). Volunteers spend hours washing, pressing and cutting the fabric. Additional time is donated to sew the quilts together and assist at the Quilt Quest itself. The students enjoy the opportunity to use their imaginations and learn that they can help others by expressing creativity. 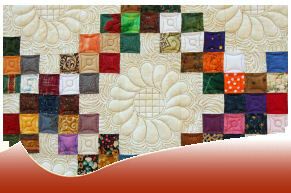 All members are invited to participate in any aspect of Quilt Quest. It's a year-round project so there's something for everyone, from providing fabric or supplies, cutting, sewing squares, making quilt kits (and/or quilts!) or distributing the quilts to helping guide the children at the Revel. Special thanks to all the Red River Quilters Guild members who selflessly provide their time, fabric and equipment. The project’s success would not be possible without them.